If one can concentrate on practicing the (seven lines prayer) in this life, when you die you will dissolve into the mind of Guru Rinpoche. Guru Rinpoche is the ultimate nature of the embodiment of all Buddhas. 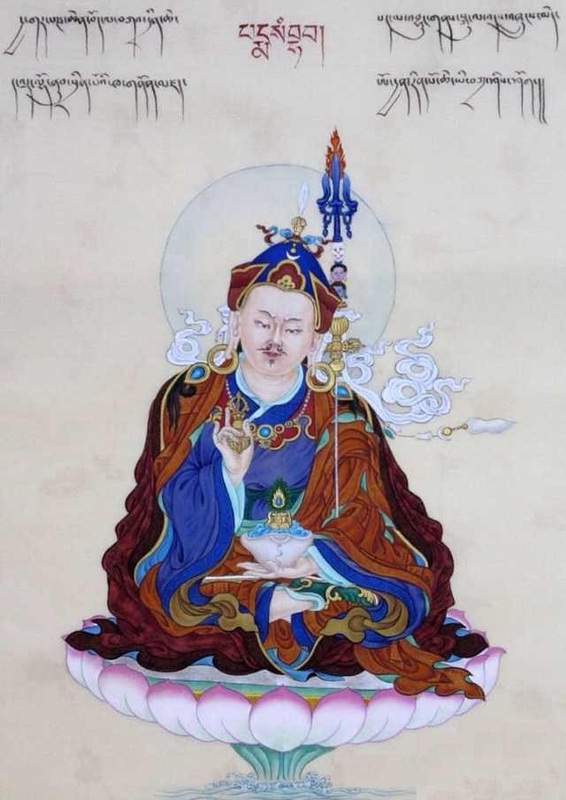 In Guru Rinpoche’s termas, it is written that in the degenerated times, Guru Rinpoche’s compassionate blessings are swifter than that of other Buddhas. In this life, if you wish your body to be free from sickness or pain, pray to Guru Rinpoche and you will receive his protection. If you seek for wealth, longevity or wish to clear your obstacles, just by praying, all wishes can be fulfilled. Some people think that to practice Guru Rinpoche for wealth is of no use, but this is not correct. Just by relying upon Guru Rinpoche, all wishes can be achieved. Guru Rinpoche once said, “Accomplishing me is the same as accomplishing all Buddhas; seeing me is the same as seeing all Buddhas.” In any case, Buddha Shakyamuni, Amitabha, Chenrezig , the Eight Vidhydharas, the Eight Mahasiddhas are no different from Guru Rinpoche. Therefore, if one wishes for attainments, then the sole method is Guru Yoga. There is no other way. Therefore, at all times, focus on the Seven Lines Prayer and supplicate Guru Rinpoche. This will have infinite benefits for this and future lives, there is no doubt about it. If one cannot practice other methods, just practicing the seven-lines prayer is the same as a panacea that can cure all kinds of sicknesses. But if one is merely mouthing the prayers, it is not enough, one should have great faith and devotion to Guru Rinpoche and supplicate one-pointedly, then you are sure to receive Guru Rinpoche’s blessings and accomplishments. In the past up till the present, many great masters and practitioners have seen Guru Rinpoche directly. These are the best signs. The middling signs are to have good experiences arising. The lesser signs are to meet Guru Rinpoche in dreams and to receive prophecies and blessings from Guru Rinpoche. Just listening and contemplating the Dharma is not enough to attain liberation. Besides that, one has to practice. The three (listening, contemplation, practice) must be combined. When we are practicing, we should rely on one deity. It is just like in the past, Nagarjuna and Shantideva had yidams they relied upon. In this manner, single-mindedly praying to Guru Rinpoche and merge your mind with Guru Rinpoche’s wisdom mind. This way of progressing on the path to liberation has less difficulties and obstacles. With total confidence and faith in Guru Rinpoche, not just with faith and sincerity, but believing that in any moment, Guru Rinpoche will never deceive or let us down. We must have the faith that Guru Rinpoche and our root teacher is inseparable and no different. Rely on this faith to practice. As our present root teacher has a very close connection to us, we are able to see our root teachers frequently. Therefore, their blessings enter our minds very swiftly. In the past, there was a Khamtrul Rinpoche. In his practice experience, he came to Guru Rinpoche’s pureland where many Dakas and Dakinis welcomed him and escorted him to see Guru Rinpoche. At that time, he wondered how Guru Rinpoche would look like. But when he came to the celestial palace, sitting on the throne was his own root master. The Dakas and Dakinis told him that the person sitting on the throne was Guru Rinpoche. This shows that Guru Rinpoche is no different from our root master. I hope everyone would be able to practice the Dharma correctly. This entry was posted on 14141414, in Practices, Teachings, Uncategorized and tagged guru rinpoche, Namkhai Nyingpo Rinpoche, padmasambhava, seven line prayer, seven vajra verses. In 1983, in his pure vision, His Holiness Sera Yangtrul Rinpoche visited the Orgyen pureland to receive empowerment from Padmasambhava. Subsequently, this Thangka/painting was made to depict his experience. Anyone who sees it will definitely be liberated! This entry was posted on 14141414, in Uncategorized and tagged holiness, padmasambhava, Sera Yangtrul, Thangka. The prayer of seven vajra verses is commonly known as Guru Rinpoche’s prayer. The Vajra refers to something that is stable, unchanging and indestructible, which can destroy all negativities, adverse circumstances, obstacles and be all-victorious. There is no (obstacle) so firm that (the vajra) cannot remove. When oneself or others feel any discomfort in the body, or if the environment is unclean, or when meeting with any obstacle or negative provocation, just reciting this prayer of seven vajra verses with a completely sincere mind, all the Buddhas, Bodhisattvas, Gurus, Triple Gems, virtuous protecting Dharmapalas would be sure to arrive and render help or give blessings. This entry was posted on 14141414, in Practices, Uncategorized and tagged Blessings, guru rinpoche, padmasambhava, seven line prayer, vajra, Verses.